A friend of mine, Naty, has just moved to Vietnam, is stuck in a hotel, is quilting mad but without her studio goodies as yet. With young children and still without her home it is a hard time for any expatriate. A talented quilter and appliquer her sewing is, I suspect, keeping her together during this difficult transitional period. As well as other designs she is doing my Block of the Month and mentioned that she can’t buy embroidery thread but pictured a viscose thread she is (I think) trying to use. Here is a really great alternative, that not only works, but gives lovely results. So here you are Naty, this one is for you…..
Take one of your recently bought silks. Silk taffetas work best for this, not the dupioni, although that would work too if it is all you have. 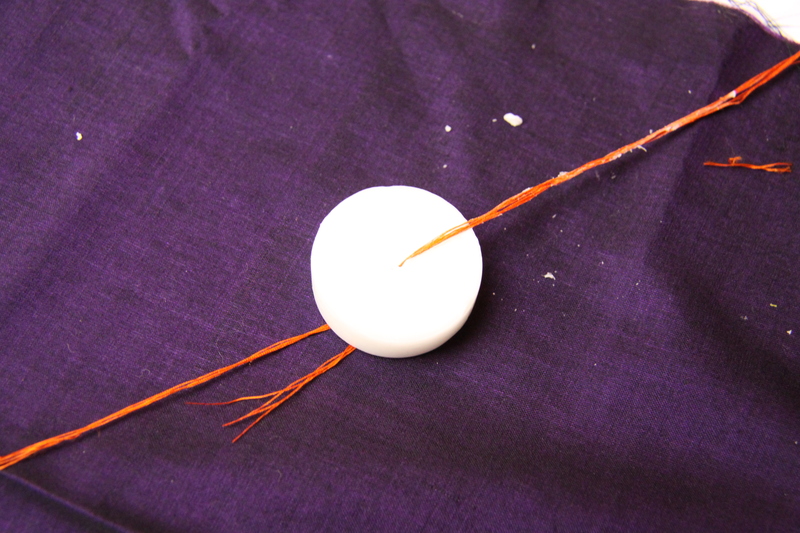 Separate three or four strands off the edge.. Take the base off a tea light and remove the wick. 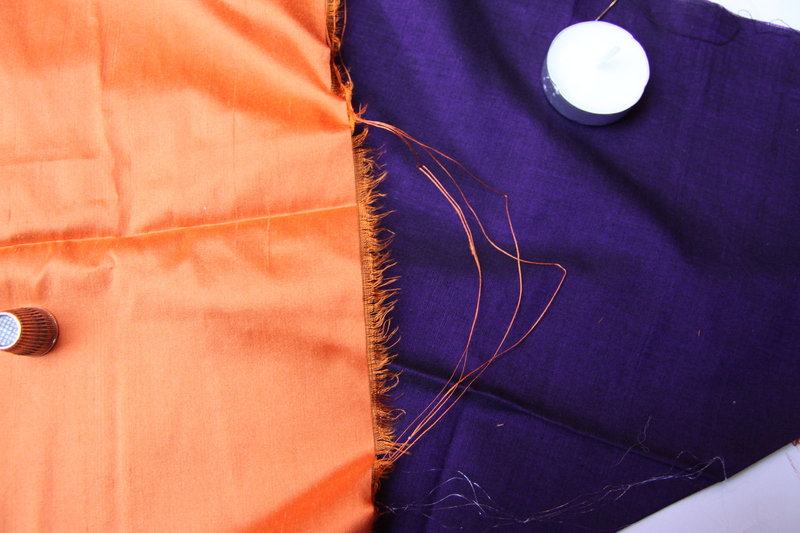 Thread your embroidery needle, run the silk through the tea light once or twice getting it nicely waxed up. 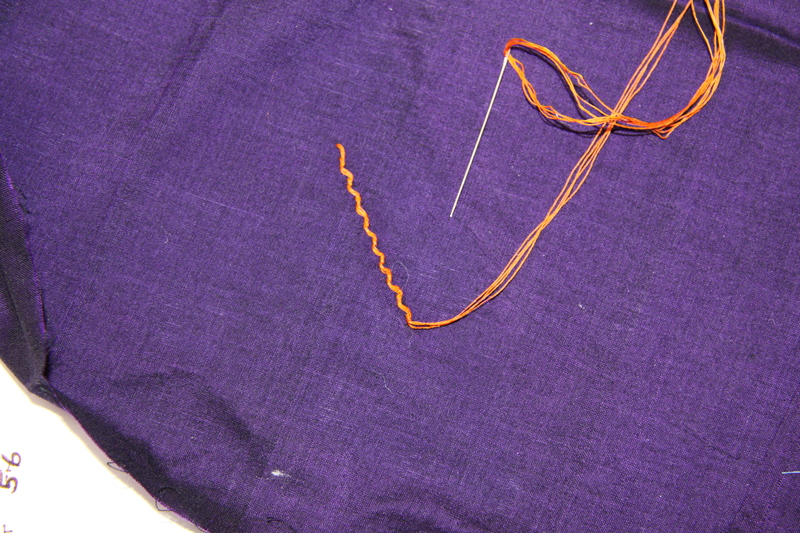 Then run it through your fingers removing excess wax and use for your whipped running stitch as usual. 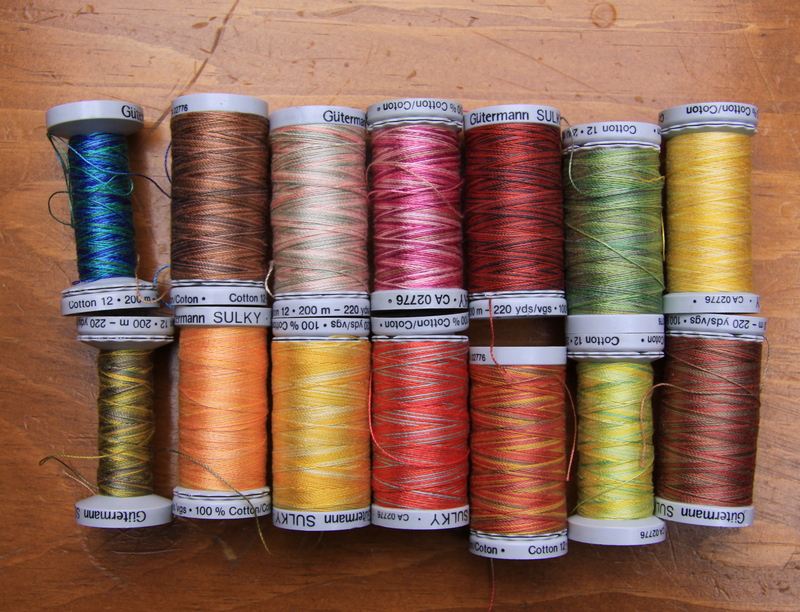 It really makes a great strong silk thread. 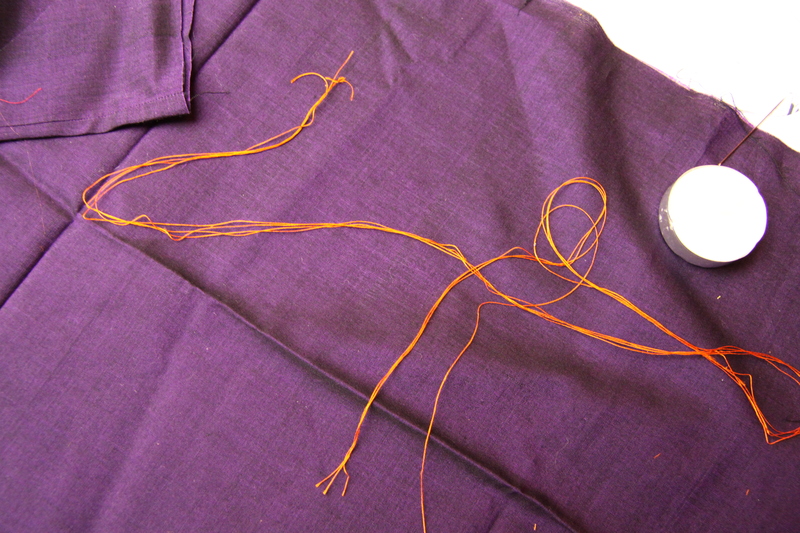 By the way you can also use just one silk thread in this manner for perfectly matched to your silk applique thread! I have been having such fun doodling away on my alternate version of Floral Impressions. I treat myself to working one block a week to keep my spirits up and to delay bringing out my dreaded purple project for its enforced two hours of applique. I describe this Floral Impressions piece as doodling because it really has been as mindless and as fun as that. I had no preconceived ideas when I started it colourwise and I’m only now beginning to think of what its final colours might turn out to be. I love the red as you all know (gush? me?) and I had decided on the stem green and one of the leaf colours but apart from that it’s just been a totally ad lib process and going with whatever colour I feel like at the time…. Given it has been that random I’m really pleased and amazed with how it’s looking. 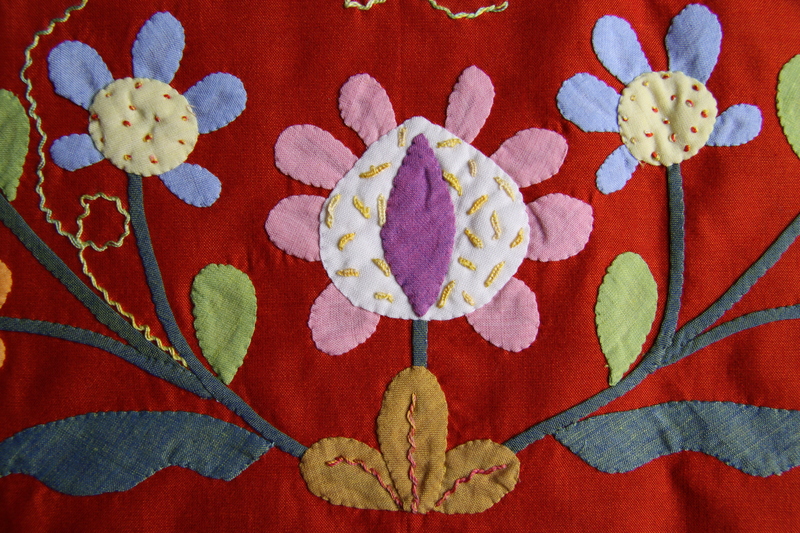 To be honest when the applique colour I have used doesn’t quite work, I find that throwing in some frankly, faintly ridiculous, embroidery just holds it all together in a very happy go lucky way. So I’ve just finished the pink daisy heart this morning (the faintly ridiculous embroidery might be referring to those buds). I love it actually and who would have thought that daisy pink would look so good on the red? And here is a photo of the whole piece so far. BOMers. Panic not when you see that this is worked in one piece and not in blocks. This is because I know this pattern so well and can make it very quickly, ie not over a period of a year, and am confident enough that I won’t muck up one block and thus the whole piece. Working on large pieces all at once is not for the faint hearted as I know to my cost. 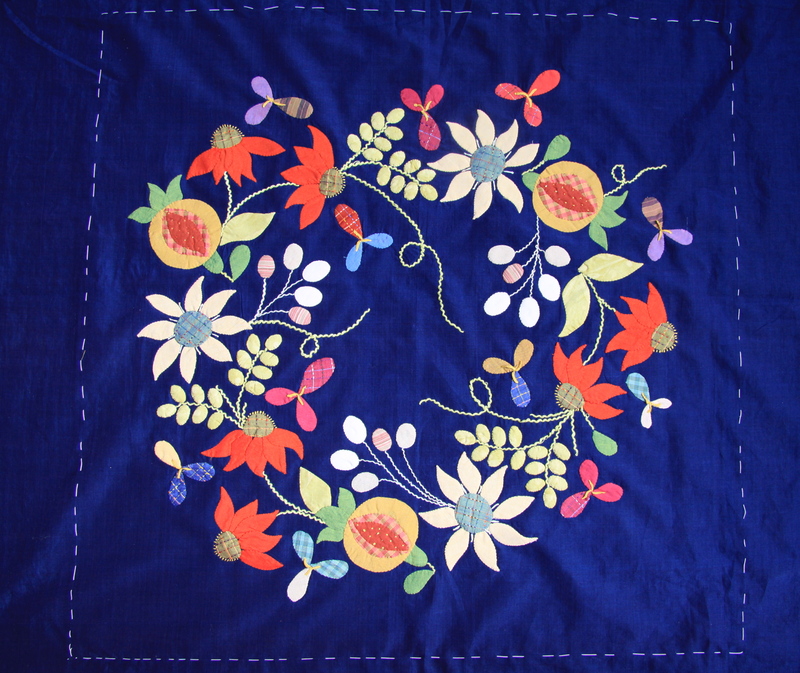 I have a large piece of applique that I have been working on for the last few months (how many? Feels like years.) and to describe it as looking like a dishrag would be too flattering. I am wondering if it will ever have that sparkling fresh and clean new quilt look once completed. It seems a bit of a long shot just now. 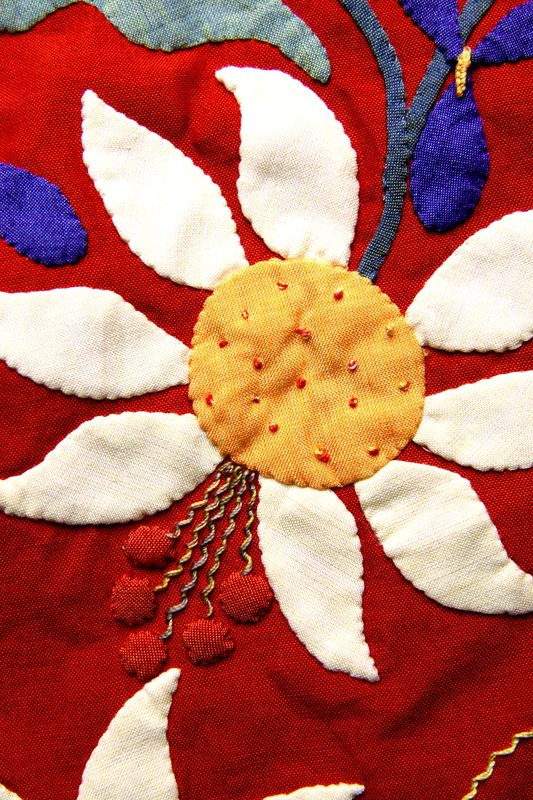 I used to work on one piece of applique at once, always (with perhaps the odd diversion of a cushion), and could never understand those people who wrote to me to tell me of their many projects they work on concurrently (let alone UFOs ha ha, totally beyond my comprehension). Now I find myself in the same position with three projects on the go at once. I find this way of working has none of the creative reward of working on one thing at once. My purple project and I hate each other so much that I seem to have developed the equivalent of writer’s block. In despair a couple of weeks ago I decided the only way to actually ever get it finished would be to put it on my weekly list (I am a list girl) and so there it is – Monday through to Friday, 2 hours a day. It is two hours I dread but I do it for the gratification of ticking a chore off my list, not for the love of the quilt. Surely, eventually, it will be finished. I hate it with such a vengeance just now but I hope that once it is finished, quilted, bound and been put in a drawer for a few weeks I will take it out, fall in love with it and wonder at my fickle nature. So now I’ve had my fun, doodling on the red, procrastinated further by writing an unnecessary blog, it’s time to do my two hours’ penance. It’s been nearly two weeks since I wrote but I haven’t been idle. 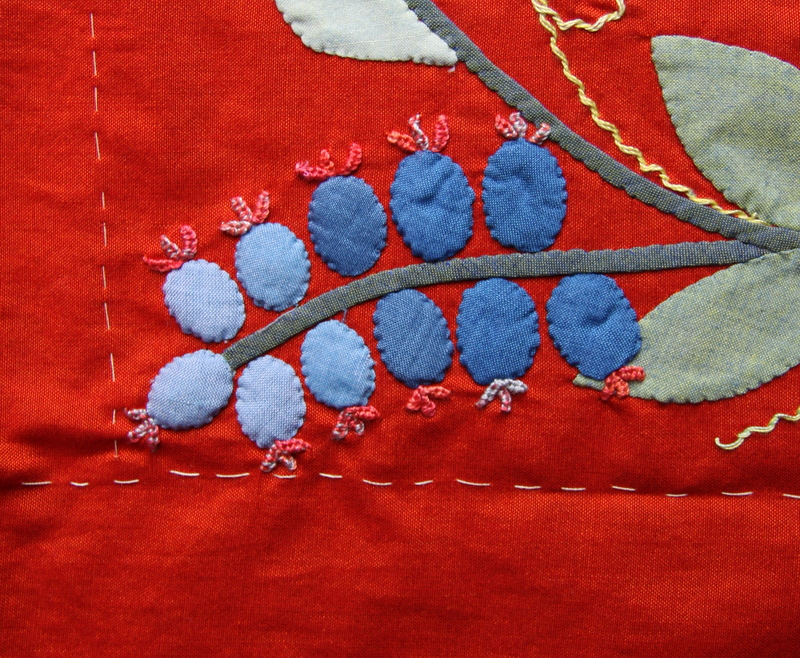 In fact my fingers are tender from so much applique so I think I deserve a break. I also hosted our first Montreal Block of the Month group last week which was so much fun and I’m just sad that all of those doing it, all over the world, couldn’t have been with us. Twelve of us spent the morning working on The Olive Wreath and I’m hoping to see some completed blocks soon. 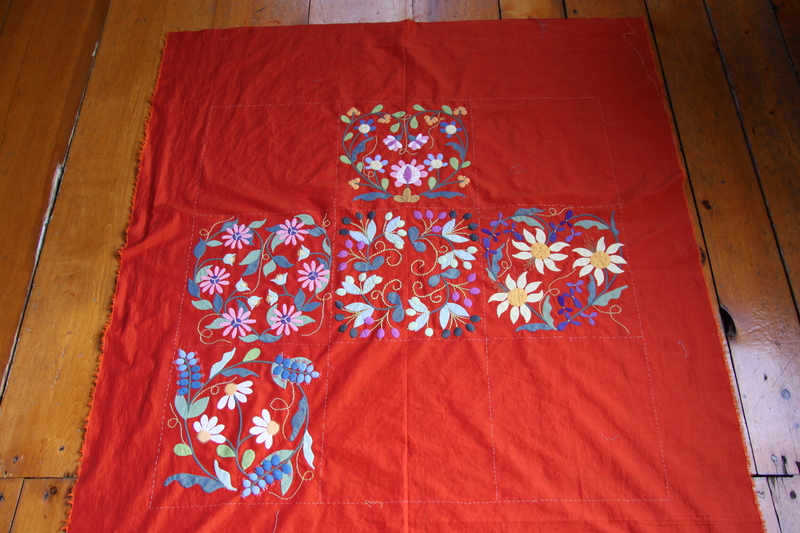 I recommend using three Sulky 12 Embroidery Cottons for the blocks. I can’t remember when I discovered this thread but I love it and am using it more and more in my work. I have just bought a whole load more to add to my collection……. 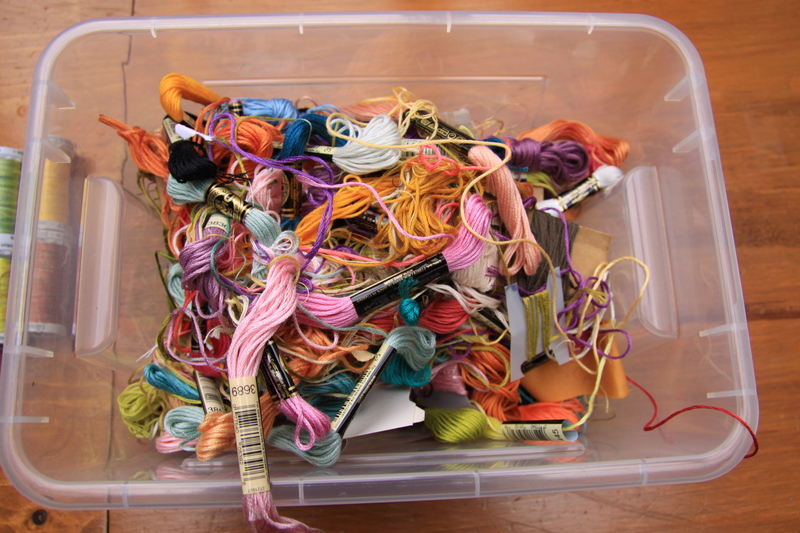 According to the Gutermann Sulky website, one strand of this thread is equal to two threads of embroidery floss. The subtle colour variations add for some great embroidery effects. 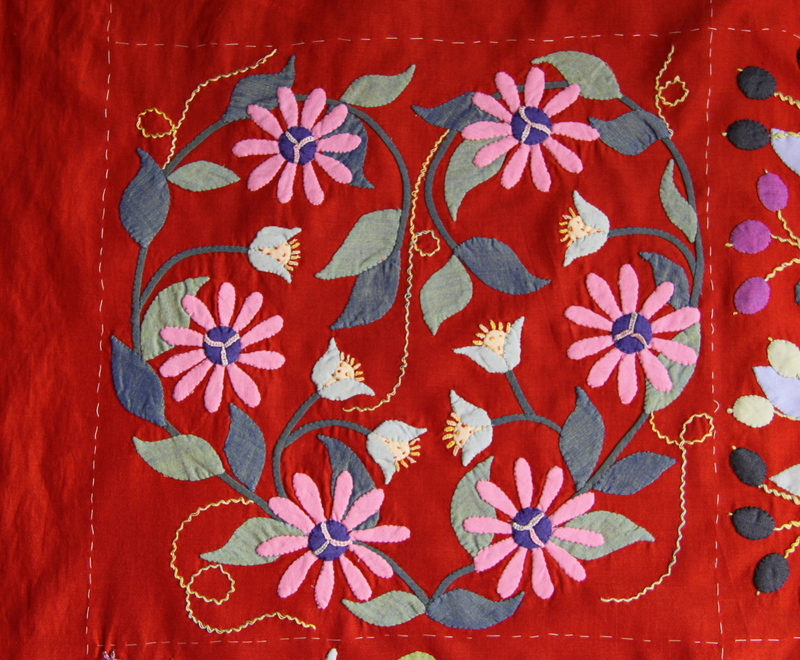 Here are some photos of some of the embroidery I have done over the past week with this thread……. It’s been a busy week what with the Block of the Month launch and my local guild meetings. Throughout the week I felt distracted by wanting to complete my 24 ” Harvest Wreath block. I had never actually made it up in hand applique and I was anxious to see whether it would work or not without proper stems (not in the original design). I was also keen to see another rendition of the plaid/plain mix I discussed a couple of weeks ago. I just love it – its colours are radiant and although not yet finished, here it is, a perfect piece for the first week in October – I don’t think any of my design/fabric combos could be more autumnal than this!